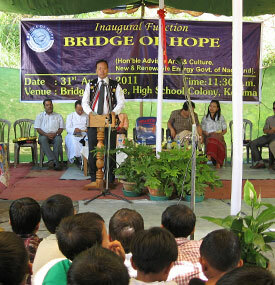 The Bridge of Hope staff led the audience in praying for the new Bridge of Hope center. Government officials wholeheartedly supported the opening of the Bridge of Hope center, recognizing the good it will bring to their community. In late August, a new Gospel for Asia Bridge of Hope center opened in a region of South Asia that is completely different from the rest of the continent. The area’s uniqueness is found in that, although it is set in a continent where Christians make up a tiny percentage of the population, it is home to far more Christians than non-Christians. Many in this area chose Christ as a result of faithful missionaries who served there during the 1800s and early 1900s. Unfortunately, over the years, the Christian faith became watered down, and today, many who identify themselves with Christianity view it as a cultural heritage. Now the youth in this region are embracing materialism, immorality and substance abuse rather than Jesus. This new Bridge of Hope center will show Christ’s grace and truth to students ranging from kindergarteners to teenagers. Students at Gospel for Asia’s Bridge of Hope centers receive an education, a daily meal, medical care, school uniforms and, above all, the message that Jesus loves them. The grand opening celebration for this center included the reading of God’s Word and prayer. A few government officials, who were special guests at the event, gave their wholehearted support of the outreach program. Center leaders seek prayer that the students will embrace the heart of Christ so they will be a source of change for their churches and their families. 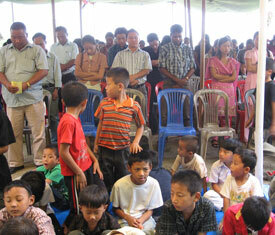 They are praying for these Bridge of Hope children to lead a revival in the area. See how a Bridge of Hope center blessed Rati’s family. Allow more children to experience Christ’s love at a Bridge of Hope center.